For the REALLY retired…I used the It's My Party Designer Series Paper and the Tasteful Trim Bigz Dies (I'm pretty sure I'll never get rid of that die as it's awesome for scrapbooking. The recently retiring, I'm using the Sweet & Sassy Framelits. These are the heart dies and I will tell you if you don't have a heart framelit set, this is a good one and there isn't anything in the upcoming catalog that would be a good substitute. Think about it…it's a nice set. 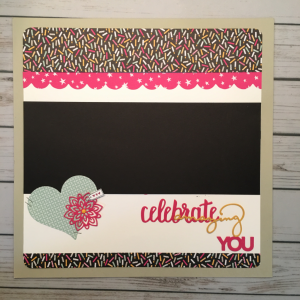 For the "current", the Flourish framelit makes a lovely flower and the "new", is the the Celebrate You framelits…you it's a little mix of everything. This page is intended to have three photos matted along the center black cardstock. I think I will use Adria's Bday photos as the candles in the DSP make it seem a little bday-ish.